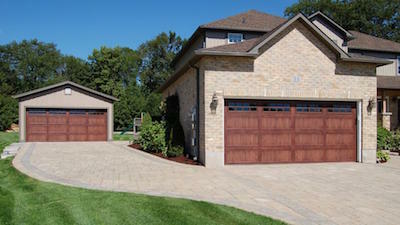 Above All Garage Door Company has vast experience with residential and commercial overhead doors. We happily serve the Denton, Dallas, and Ft. Worth area of North Texas. Being a local small business we love working with other local business owners. Our goal is to deliver quality overhead doors coupled with topnotch service to all of our customers. If you are a local business owner in need of overhead door repair please give us a call 940-300-3533. We offer free estimates on garage door replacement and repairs. Your garage door is the last thing you see leaving your home and the first thing you see when you arrive. Maintaining your garage door will increase the lifespan and keep it looking sharp for years to come. We have put together easy to follow instructions on maintaining a garage door. We suggest using a non-corrosive soap or detergent when cleaning your garage door. Mix your soap or detergent into a 5 gallon bucket. Rinse your garage door with a garden hose to wash away any dirt or dust that may be on the surface. Using a sponge or soft bristled brush clean your garage door removing any dirt or debris that wasn’t washed away with the garden hose. Thoroughly rinse your door again making sure all of your cleaning agent has been removed. If you have windows on your garage door we suggest using a household glass cleaner and paper towels to clean them. Using paper towels will keep from leaving streaks on your windows. Keeping your garage door properly lubricated will increase the life of your garage door’s hardware. All-metal rollers: Use a nonsilicon-based lubricant such as motor oil. Nylon rollers: Lubricate the bearings, but make sure the oil does not come in contact with the Nylon rollers. Do not lubricate the roller tracks as this can cause your door to come off the track and become unbalanced. Clean the garage door tracks with a cloth and brake cleaner or degreaser. Wear protective gloves as the cleaning agent can be harmful if it comes in contact with your skin. Make repairs as needed, following the instructions in the garage door owner’s manual, or call a trained technician for assistance. Above All Garage Door company serving Denton, Dallas, Ft. Worth with exceptional quality garage doors is proudly providing our customers with C.H.I. overhead doors. C.H.I. overhead doors are superior quality garage doors for both residential and commercial use. Recently C.H.I. has been improving on their manufacturing process which means we can provide our customers with an even better product. Test out ourDoor Builderto see how beautiful C.H.I. overhead door would look at your residence. C.H.I. Overhead Doors recently introduced Accents Woodtones, an innovative wood grain finish, to micro-grooved models 3216P and 3285P. The clean, simple lines of the micro-grooves allow this garage door to easily blend in with traditional or contemporary styles, making it exceptionally versatile. “We have been receiving numerous compliments from our distributors about how this product is increasing their ability to introduce the homeowner to additional designs that enhance the architectural appeal of the home,” stated Merle Miller, Marketing Specialist at C.H.I. Accents Woodtones is available in four options: Cedar, Mahogany, Dark Oak, and Light Oak. Either model can be customized with window inserts and designer lites currently offered by C.H.I. See all garage doors available from C.H.I. Overhead Doors at https://www.chiohd.com. C.H.I. Overhead Doors is a prominent manufacturer of high-quality Residential and Commercial Sectional and Rolling Steel garage doors. Started in 1981 in Illinois Amish Country in Arthur, C.H.I. has risen to become an industry leader in innovation and quality. A mix of hand-made craftsmanship and computer-aided precision join together to make C.H.I. Overhead Doors…The Door To Quality. The Internet of things is revolutionizing every aspect of our lives. 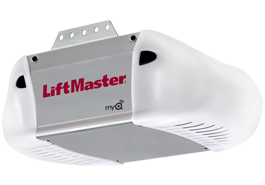 Above All Garage Door Company is excited to provide Denton, Dallas, and Ft. Worth with LiftMaster MyQ technology for residential and commercial garage doors. This technology delivers peace of mind with the ability to check if your garage door is open or closed right from your smartphone. TheLiftMaster 8365-267 is our recommended smart garage door package. If you are interested in the LiftMaster 8365-267 smart garage door packagecontact usfor a free quote. Call us day or night. 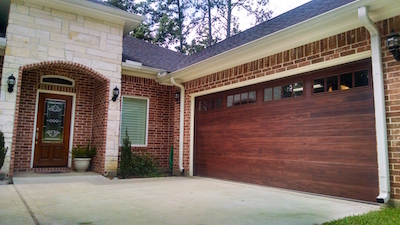 Above All Garage Door Company offers the DFW metroplex 24 hour emergency service.